Whether you're looking for a genuine corporate personality or a more cheeky, fun and energetic vibe.. You'll find men, women and kids warm to Fie very easily! TV success started when Fie was 15 as presenter of Channel 9’s kids TV program “Kids in the Kitchen.” Since then she has been a regular actor, singer and broadcaster for voiceover’s, commercials, TV and radio shows, photo shoots, music video clips, short and feature films, musicals and cover bands. Since graduating from WAAPA in 2006, where she was nicknamed “chameleon” by her graduating classmates for her ability to do it all, Fie spent 3 years at ABC Local Radio, then became Executive Producer of mix94.5’s Drive show, The Big Couch and is currently a presenter at Perth’s #1 station, mix94.5. 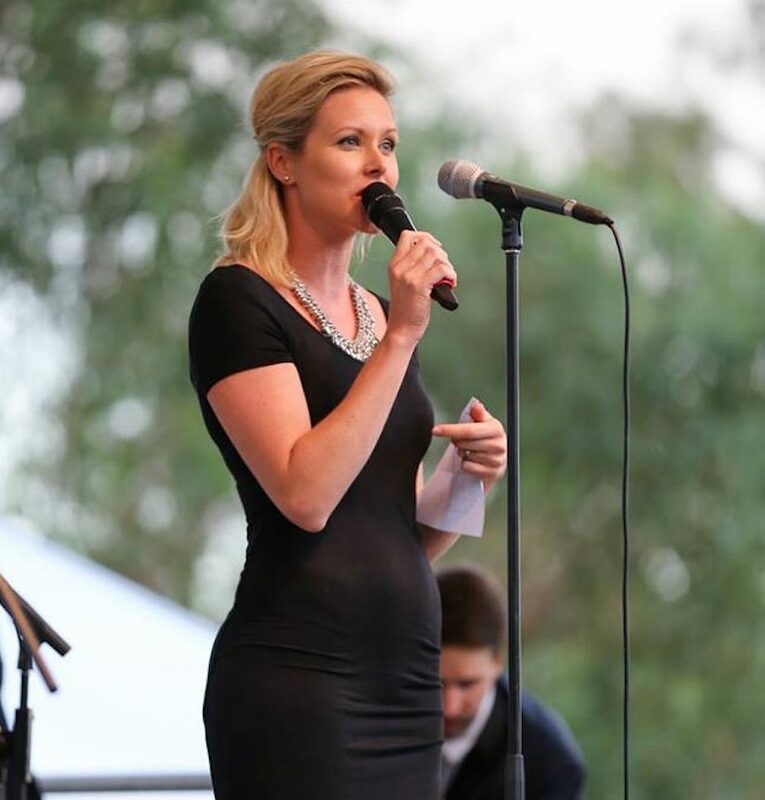 At night you’ll find her as lead vocalist singing with one of Perth’s favourite cover bands, HI-NRG. True to her testimonials, Fie a is a professional who comes well prepared, is a pleasure to communicate with, can think on her feet and will go above and beyond the call of duty. She has a Bachelor of Communications to her name and is an award winning post-graduate in Broadcasting: TV and Radio at WAAPA. "Having worked in radio and at functions with Fiona for many years I can thoroughly recommend her. A versatile all-rounder - Fiona will bring professionalism and class without making it about herself." "We've used Fiona a number of times in a range of promotions relating to the HBF Run for a Reason. She is consistently reliable and no matter what task we give her, we know she will always represent our brand to an incredibly high standard. Often, Fiona's roles with us have required her to be quick thinking and sharp, these are skills which are second nature to Fiona. No job is too big for Fiona and she's always a pleasure to work with." "We regularly engage Fiona for both voiceover and on-screen roles. Fiona is someone people instantly connect with, her energy and versatility is always reflected in the finished production, hence the reason our clients regularly request her for repeat work." Stewart Scott. Production Manager, Clip Media Motion. "Over the past 10 years I have had the privilege of working with Fiona on various projects from full on retail scripts to gentle and friendly deliveries, even the odd singing gig. Not only does she continually surprise me with her versatility and ability to bring something new to every job but she always does it with an uncompromising attitude. She is awesome to work with and a real asset to any job." "Fiona Cornelisse was employed by HBF to MC at the 'Flexi Extras Stretch Zone' activation at the HBF Run for a Reason in May 2015. The 'Flexi Extras Stretch Zone' was an activation where participants at the finish line could join a post-run stretch sequence lasting approximately 7-10 minutes run by 2 Exercise Physiologists. Fiona's role was to facilitate the Exercise Physiologists during the sequences, encourage participants to join, create lively atmosphere and deliver key messages of our new Flexi Extras product in a light-hearted way. We were very impressed with Fiona's performance. The activation was a great success and we believe it was largely attributed to Fiona's contributions in creating a lively atmosphere, making participants feel welcome and encouraging new joiners. When the activations was over capacity, Fiona was able to act quickly to find a solution and encourage participants to still join in a make-do overflow area. I would highly recommend Fiona and look forward to working with such talent in the future." - India Buttsworth | HBF Marketing Coordinator.